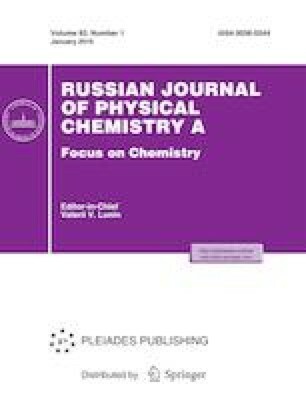 The thermal stability of poly[1-(trimethylsilyl)-1-propyne] is studied by heating a capillary column containing the polymer as a stationary phase and systematically separating a test mixture of light hydrocarbons on the column. It is shown that heating the column to 130°C does not change the column efficiency or the retention time of the sorbates. A further increase in temperature lowers both the column efficiency and the retention time of the sorbates. However, the sorbates’ retention by the polymer weakens symbatically for all of the studied hydrocarbons, while a drop in the column efficiency for methane and ethane is barely observed prior to the chemical decomposition of the polymer and is fairly pronounced for C3–C4 hydrocarbons. A particularly large drop in efficiency is observed for isobutane, for which the dependence of column efficiency on the heating temperature exhibits two-step behavior. The diffusion coefficients of the sorbates in the polymer phase are calculated; it is shown that they fall abruptly upon heating the column. However, the drop in the diffusion coefficients for methane and ethane upon heating the column does not correlate with the continued efficiency of the column for these sorbates. This work was performed as part of State Task no. 79 for the Topchiev Institute of Petrochemical Synthesis, Russian Academy of Sciences, from the Federal Agency for Scientific Organizations of Russia, state registration no. AAAA-A18-118011990148-7.